Jason Brinkmoeller serves as our Senior Vice President; he is in charge of all aspects of the execution of construction for Semper Tek Inc. He works closely with our President, Mr. Scott Matheny, to be involved and understand all aspects of the business. 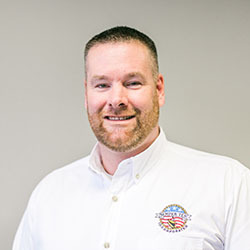 Jason has 12 years of experience in the industry and joined Semper Tek in 2012. Jason has a BS in Civil Engineering from The Virginia Military Institute. After graduating, he served in the U.S. Air Force as a Civil Engineering officer. After serving his country honorably, he entered the private sector where he has almost entirely worked in the Federal Construction Market. He holds the Certified Healthcare Construction designation from the American Hospital Association. Like Mr. Matheny, Jason also has a service disability rating from the Department of Veterans Affairs.